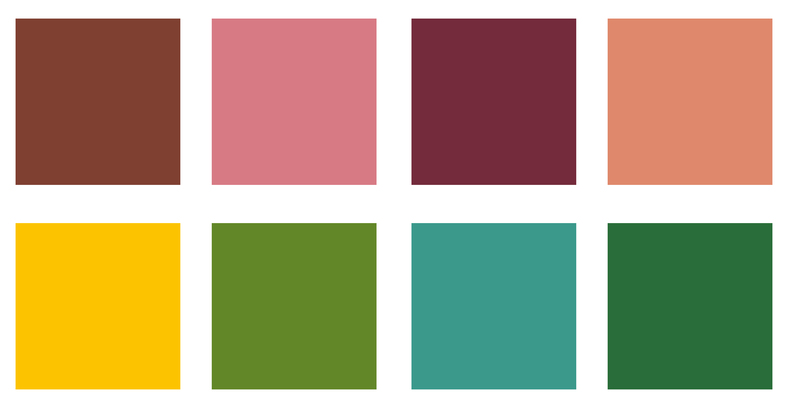 Here was my initial colour palette, created to work well with Amandine’s red hair. All the colours are warm, and have an undertone of yellow sunshine. I started by making a small, square lino print. 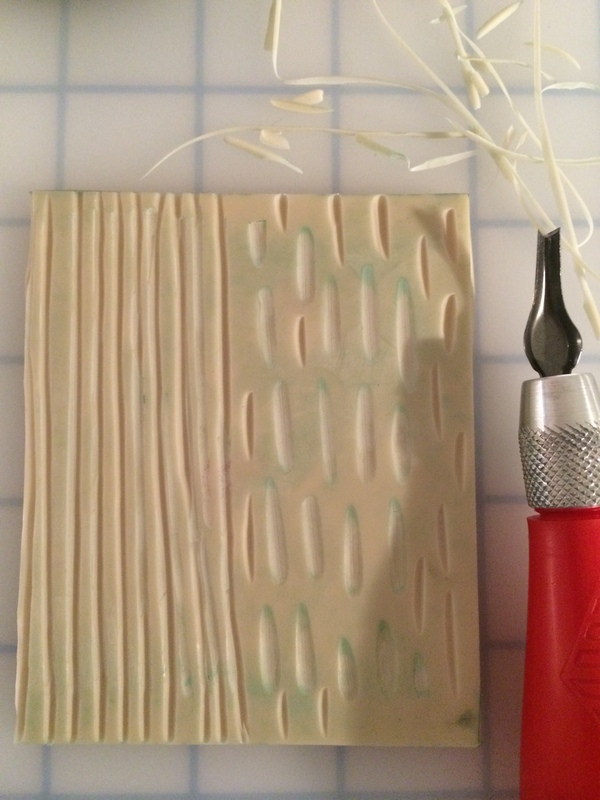 You can buy Lino and lino cutters at Cass Art supplies, or on the internet. My cutters were around £7, and the lino about £1. This comical object contains all the blades you might need, and screws together to produce an implement that you can use to stamp with. 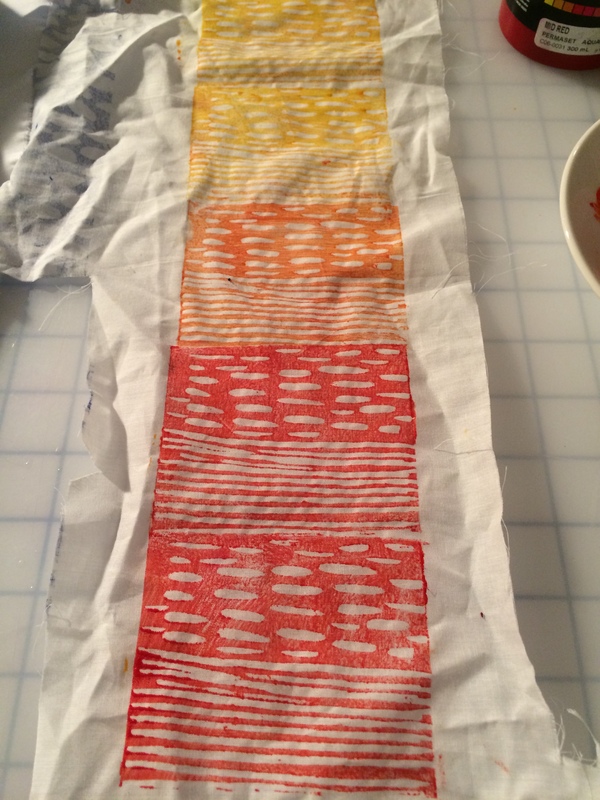 I used one of the blades to make simple stripes and dashes in the lino. This piece is cut away from a previous project (I always try to recycle). I added additional marks. 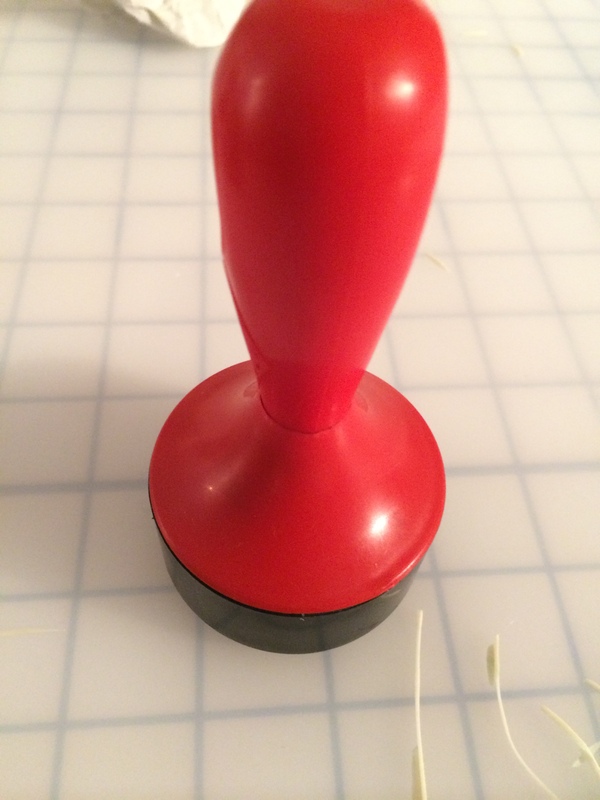 By the way this is not actually Lino, but a slightly floppy plastic called Soft Cut that works really well. It doesn’t need warming (like Lino can) and is easy and quick, especially for beginners. I started mixing colours. Some of the colours in my palette were quite subtle and required five or six shades, but orange only needs red and yellow. This was really a project about colour for me. 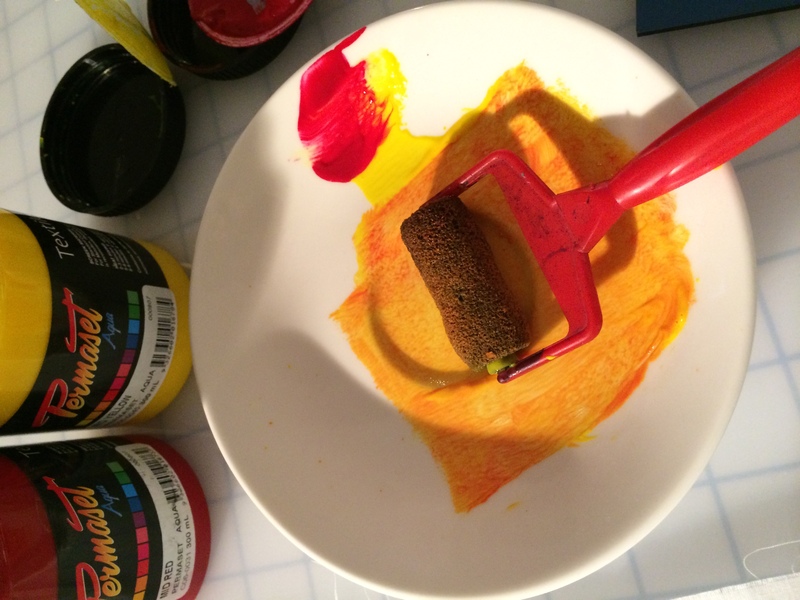 I wear cool, brighter colours myself and many of my printing exercises have used the colour straight out of the jar. Important if you want consistency. But I felt with this project I wanted lots of colour, and the chance to experiment with mixing, to see what would happen if I put green with black, white, red and yellow, for example. I then tried the colours on a piece of cotton lawn. Initially I tried my usual approach of printing each block next to the last one.I normally like to use big pieces of lino and cover the whole cloth with colour, (as fast as possible) but on this project I was thinking “square windows” and also about 1950s textiles where the images have plenty of background space to “breathe”. I was imagining that Amandine might make a 1950s-style skirt with the fabric. But who knows? We shall see. 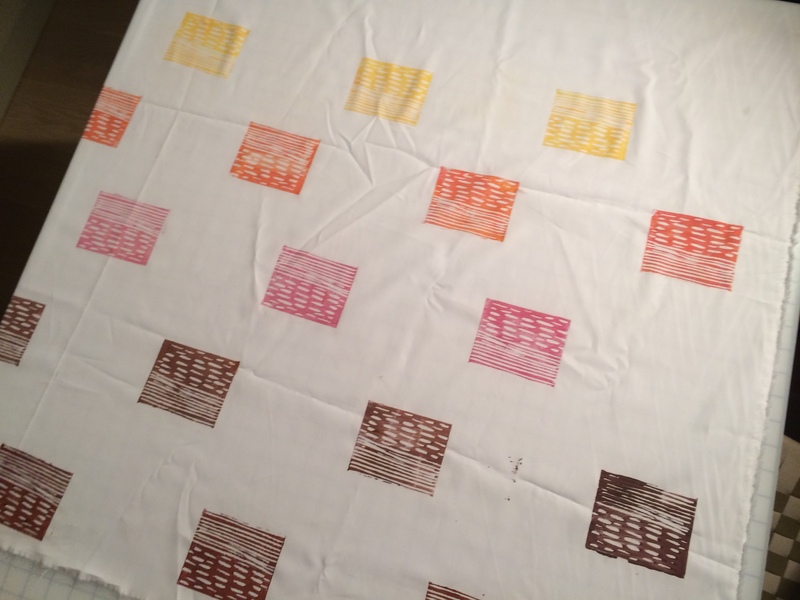 On the first day I printed all the colours in rows across the fabric, and let it dry overnight. I spaced out the Lino block using a postcard (between the columns) and an umbrella cover to create the rows. A bit rough and ready, but I find being too exact only makes it frustrating if something is not perfect. Also you will see that I didn’t place all the motifs the same way up. I just let it happen. Also overnight (in my dreams, Amandine) I thought about the white space and how it was too much. Also the print was too regular and predictable. 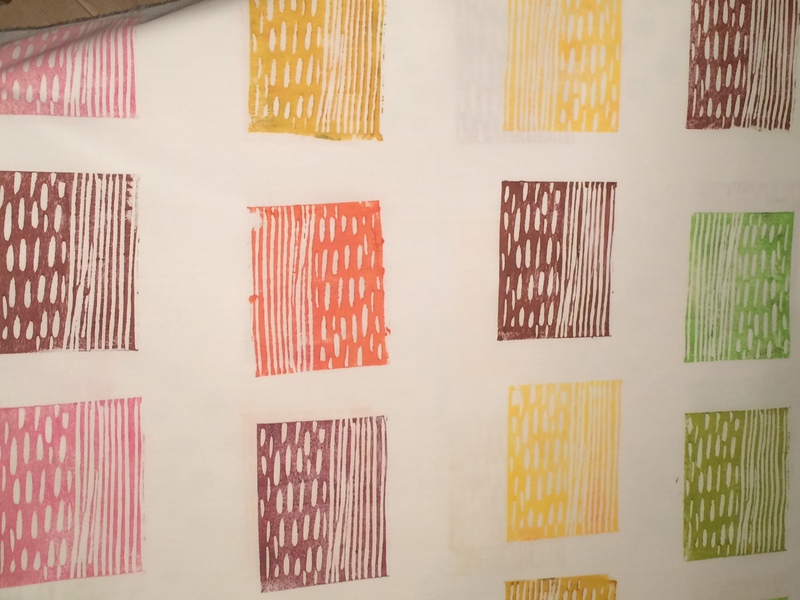 In the 1950s textile designers rejected too much regularity and became much more expressive. Also, you can see a little problem here (bottom right). I had made one of the brown blocks a bit too inky and it had come off on the white background. This doesn’t bother me that much – the whole process is rather primitive – but this is for someone else I and it worried me. Overnight I resolved to fill in the gaps, thereby improving the design, and covering up the mistakes. On the second day I filled in the gaps with a second set of colours. I revisited the original palette, and having had another look at Amandine I felt it needed to be a bit deeper, both in terms of colours (eg browns) and denser in terms of printed motifs. So I mixed new shades – a more mustardy yellow, a pea green, more browns including a pinker one. I “filled in the gaps” randomly to destroy the steady rows. Finally, once the print was completely dry, I fixed the colours by ironing on a hot temperature. I will let it hang on my drying rack for a few days just in case I want to make any changes. But I think I am done. Bravo! she will love it. I am in awe of your skills. I found your blog through artisan square. Congratulations on winning the swap by the way ! I have loved reading your knowledge on colours and thank you for the most lovely comments you have left ! I read that if you have worked out your colours then you tend not to notice ones clothes but the eye is drawn to the face. Anyway I look forward to your posts. I second Janine’s comments. Brava! I love both the print and the final colour palette. PS What is the exact paint that you use for this? I can sort of read the jars but I am not familiar with the product. Mine is done too since last week end but unfortunately my post office opens and shuts when I am at work 🙁 Hopefully Saturday I’ll be able to send it over to you Kate! !